Th-INK-ing of You: A Seed of Friendship! Hello friends! It's Sunday and time for another Stampin Sisters in Christ Challenge! I hope you are enjoying a wonderful weekend! Today is a sad day for those of us in the US, as we remember the devastating events of 9/11. It's a day we all remember... a day our lives were forever changed, and a day that much of our sense of safety was taken away. All week we have been seeing stories of the lives affected by the events of that fateful day... and our hearts are wrenched for each one. However... it is also a day to remember that there is much beyond this life. This life is but a vapor! No matter our age, we can't be sure we have any number of days! That's why I am so thankful that our hostess this week, the sweet Rebbecka, has chosen the Scripture she did. Mt. 7:7-8 7 “Ask and it will be given to you; seek and you will find; knock and the door will be opened to you. 8 For everyone who asks receives; the one who seeks finds; and to the one who knocks, the door will be opened. If you have been seeking.... if you are looking for answers.... for real meaning to this life and for real purpose for your own life.... I urge you to seek HIM! This is an absolute promise.... that if you do, He will open the door for you! How do we do this? We have to seek Him through prayer and studying His Word! He has left us His Word... and it gives us EVERYTHING we need to know Him in a personal way, as our Savior and our Lord! Just as 9/11 marks a date that forever changed the United States, the day you meet Jesus will forever change your life! Instead of a sad day, it will be a day when the weight of sin will be lifted and forever removed from you, and a day when you will realize how dearly He loves you, and has given you this life as a gift, and He has a purpose and plan for your life! You will have a hope and a sure future with Him in heaven! You will have joy that fills your soul, even when you go through deep trials and pain. It's so sad to think of all the people who die every day without Him! It's so simple... but so many miss it! Simply come to Him in faith and ask Him to forgive your sins and to be your Savior.... seek to know Him in His Word.... and He will open the door for you! Jesus willingly gave up His life for ALL who would believe in Him! There is no greater love! Becky's challenge this week is to have a door or window on our project. There are many ways this can be achieved, even if you don't have a door stamp or image. You could make a door that opens, perhaps even like a gate fold card. You also could go to your home improvement store and look for brochures on doors and use one of the images in the brochure (I have done this before!)... or you could use designer paper such as I did here. This is a new pack from BoBunny called Welcome Home. This particular sheet has a house with beautiful glass doors on the first floor and also on the second floor. It is faint, but it's very visible in person. I created my card around that image, leaving that part of the paper completely uncovered. It reminds me of a neighborhood where good friends live and welcome us in. That led me to use this seed of friendship sentiment from a new Our Daily Bread designs set called Seeds. I stamped the image with Versafine Ink and cut with SB Fancy Tags 2. I cut a second fancy tag and cut part of the oval out, then laced it behind the top one forming a diamond frame. I added an MS punched strip through which I laced sheer ribbon to qualify for this week's Shining the Light Challenge over on the ODBD Blog. I made a little bouquet of flowers which are part Prima and part ZVA Creative, added some MS punched boughs and some Fanciful Flourishes from Cheery Lynn. A little sewing, which qualifies it for Stamping in Time (Our Daily Bread Designs)- faux or real stitching and some pearls and I was done. Be sure to stop by the SSIC blog for all the details of the challenge and to read Becky's Devotional! I know it will bless you!!! Our sponsor this week is Simon Says Stamp! They are giving away a great set! See it on the SSIC Blog! We thank SSS for their continued support! Be sure to stop by my DT sisters to see their take on this week's challenge! I love the door on the DP, perfect. The colors of this card are so soft and comforting. Great card. Have a great week! Oh Grace, this is absolutely stunning!! I just love the use of dies to frame the sentiment and the dp with the door on it. Very clever!! Gorgeous! Hope you have a great day!! TTYS! Beautiful, Grace. So delicate and peaceful. Well written post, thank you for sharing it. Wow, Grace, this is stunning!! Your card design so beautifully frames your sentiment and the details are wonderful!! I love reading your devotional words, also...and the comparison to 9/11...I hope others that are truly seeking will be helped by this as well! Hugs and have a blessed week!! Gorgeous card with such beautiful colors. This is gorgeous Grace, wonderful colors and love all those swirls. Grace, this is so beautiful. Fabulous card, thanks for joining us at Alphabet Challenge! Grace, this card is so beautiful....just like the music on your blog! Amazing Grace....my favorite! Thanks once again for making me feel loved... and thanks for such a gorgeous card, as always. Hugs and love.. This is so pretty, I love all of it! It's been too long since I visited your beautiful blog, but my visit is all that much more enjoyable for the wait. Thoroughly incredible and gorgeous designs. Oh, you have such a gift! Your flowers and flourishes are so pretty on this one. Beautiful paper and die cuts. So lovely! Grace this is a wonderful card - love the colours and the dp is so fitting. This is absolutely stunning, Grace! The paper is gorgeous and so are your flowers and die cuts! Brilliant idea for the SB tags! Hugs! Wow, what a cute and beautiful card. Love the sentiment, and the papers are lovely too. Woo hoo!! I get to comment again on this gorgeous creation again. Jaw dropping my friend!! Thanks for supporting the Shining the Light challenge with your awesome talent!! What a beautiful card. I love it! Thanks for joining in at Allsorts this week for my Flowers and swirls challenge! Oh Grace, what are beautiful blog. And your cards are so wonderful. Who ever receive one are sure to be bless and enjoy them. Thank you for checking out my blog and wanting some of my little flowers. I need your snail address,only 4 signed up so am sending 4 sets. Thanks again dear sister in Christ. Very gorgeous card! I love the paper, die cut with the sentiment, and the border punch! This is a fantastic card loving the way you have used the die for the centre piece! Thanks for playing at Allsorts this week and good luck in the draw! Thanks for joining us at Creative Inspirations paints challenge this week! Great card! I love the dies/punches that you used. Thanks for planing in our Bugaboo Challenge. This card is amazingly gorgeous! Thanks for playing with us at OSAAT. What a brilliant project Grace, so elegant. Thank you so much for entering the Allsorts challenge with it and good luck! Your post is so true. What a wonderful way to witness to people. Your card is beautiful. Thanks for playing in Clearly Inspired Challenge. The new challenge was posted today so I hope you come over and play again with us. Gorgeous, Grace! Your design, colors, and details are all so stunning! Beautifully done! Thanks so much for supporting ODBD Stamping In Time Challenge! Oh my! This card is classic 'Grace" elegance! 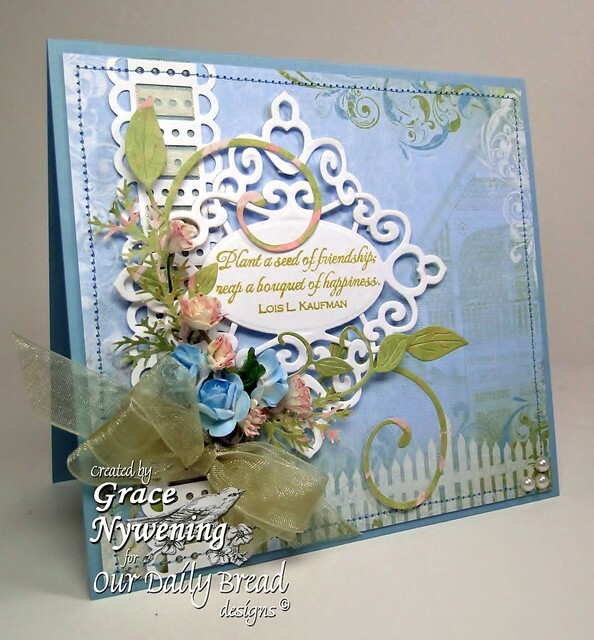 A beautiful use of the DP, and very lovely job of embellishing with the dies and the flowers. And the quote, it so aptly describes the heart of the card maker!